S450A | Process Equipment & Supply, Inc.
Each model consists of a power supply, a converter, and a mechanical probe or horn. 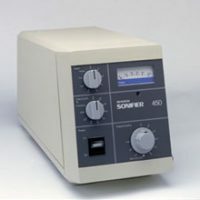 The power supply/converter changes standard electrical power to high frequency mechanical energy, which is then applied to the horn, where it is further amplified for use (often with specialized accessories). 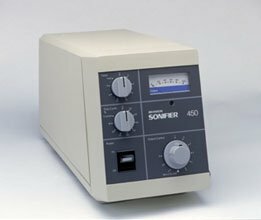 Sonifier® S-450A analog ultrasonic processor includes many features to make the technician’s work easier.